Facebook has incorporated new features into its Messenger app, and they may seem familiar to iMessage users. Facebook Messenger now lets users add emoji reactions to individual messages, just how Facebook users can “react” to posts in their News Feeds. Facebook is also giving users the ability to include @mentions in their messages. Both of these new features will begin rolling out on Thursday and will be available globally in the coming days, according to Facebook. You can add an emoji reaction to any message, whether it’s a text comment, a photo, or GIF. These emoji reactions include five different emotions—from love to wow to angry—as depicted by smiley faces, plus Facebook’s signature thumbs up to signify a “Like.” For the first time, Facebook is also giving users the option to “dislike” something with a thumbs down emoji. To add an emoji reaction in Messenger, simply tap and hold on an individual message. Adding a reaction will trigger an animation, and these reactions will remained fixes in the lower corner of the message. You can tap on the reactions to get more details, like how each Facebook friend reacted. If you haven’t launched the Messenger app, you’ll receive a notification when people react to a message. Similarly, mentioning a Facebook friend in Messenger will trigger a new kind of notification for the recipient. It will include more details about the specific message you were mentioned in so that you can respond more quickly. 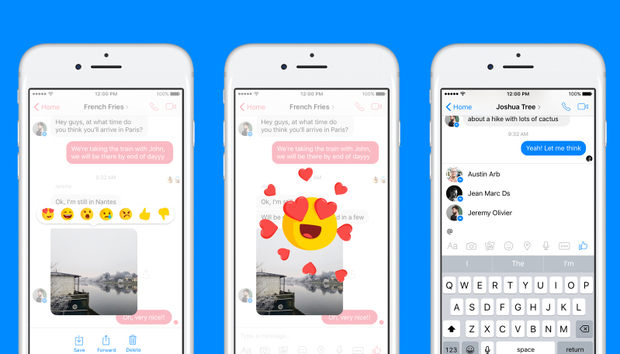 Why this matters: Facebook Messenger has been rapidly adopting new features to become the most powerful tool for visual communication. With the latest update, Messenger is somewhat of a hybrid between Snapchat and iMessage in iOS 10. Apple’s “emojification” of iMessage was one of the most prominent changes to iOS in recent years. Like in Messenger, iOS 10 users could add emoji reactions to individual messages. Apple calls these reactions “Tap Back,” and they essentially have the same function – to keep the conversation going even when you don’t really have anything new to add. The only difference is that Facebook Messenger is available on Android, too. Meanwhile, it appears Apple continues to expand its tools for visual communication. Just this week, the company unveiled the forthcoming Clips, a new iOS app for making quick stylized videos to share on iMessage and on Facebook’s own properties like Messenger and Instagram.